I plan for this article to be the first of a series discussing marine reef aquaria as ecosystems and how we should manage them using an ecosystem or holistic approach, as opposed to the micromanagement philosophy that seems inherent in most reef aquarium husbandry. I suppose this more inclusive approach comes naturally to me; after all, I am a professional ecologist and, to me, such an approach simply seems natural. Nonetheless, to the average aquarist whose familiarity with ecosystem management is fleeting at best, such a management proposal must seem daunting. Well, it shouldn't be. Actually, what this kind of management means is that we let the organisms do most of the dirty work, whilst we aquarists sit back and enjoy the fruits of their labors. In other words, once we cut through the buzzword bingo, this is the easy way to go, and in fact many aquarists are well on their way to being ecosystem managers. They just don't know it, yet. Before I launch into the discussion of aquaria as ecosystems, it is probably worth considering what an ecosystem is. In this discussion, it is well worth considering that the term "ecosystem" or, frankly, "eco-anything" is severely overused in our hobby as a marketing tool and by people who have a seriously deficient understanding of the term. The term "ecosystem" has a standard definition in ecological science as a community of organisms and its associated physical environment. First off, most ecosystems are not natural, in the sense of being a defined natural unit with precise boundaries. Rather, as noted above, the term "ecosystem" is a human label put onto an assemblage of organisms within their environment. However, as it is generally understood, the boundaries of that environment are well chosen and reasonable. For example, a lake and all its inhabitants may be considered to be a self-contained ecosystem with reasonably precise boundaries. Other ecosystems have less precise boundaries and, frankly, a coral reef ecosystem is one of the harder ones to define and circumscribe. For example, I have been in a research submersible descending on the outside of an atoll, and it was very hard to decide when we passed out of a coral reef environment into one that was simply a sea mount. No matter how the boundaries are drawn, ecosystems are generally considered to be stable over reasonably long periods of time. Radical and unpredictable changes in such systems do occur; for example, the massive fires which burned much of the Yellowstone Park ecosystem in the late 1980s. However, in most cases the changes are generally predictable and gradual. Once we know enough about the system, we may be able to predict how the organisms will interact and how the system will operate. In effect, if we know enough about an ecosystem, we may choose to manage that ecosystem in a conscientious and reasonable manner. This is the rationale behind the management scheme for ecosystem-sized parks such as Yellowstone National Park. One of the truisms in the reef aquarium hobby is that there are a lot of different approaches to solving any problem. If I may be so presumptuous as to consider reef aquarium keeping as a hobby "discipline," such as horticulture, then the multiplicity of approaches we see in the reef hobby is indicative of a discipline that is neither mature nor successful. It highlights the fact that most aquarists, and most aquarium authors, simply know very little about the organisms they wish to keep or are writing about. Unfortunately, as well, they know even less about how to keep them alive and together for any length of time. Unfortunately, the "multiplicity of approaches" also means that the organisms suffer while various techniques of varying efficiency are used to determine the care that the organisms require. Consequently, it is worthwhile to ask the following two questions. The first question is,"Why do we want to consider yet one more approach to managing aquaria?" The answer is that the approach of considering aquaria as miniature captive ecosystems has been used by scientific researchers for many years and it works - and works well. The second question is, "Why should we want to consider and manage aquaria as ecosystems?" The answer is simply that if aquaria are some form of an ecosystem, then more than 50 years of research about natural marine reef ecosystems may be used to assist us in making decisions about our marine reef aquarium systems. The closer we come to having an analogue of nature in our systems, the more we may draw on the experiences of researchers, divers, and natural historians to help explain what happens in our tanks. If we want to consider our boxes of salty water, rock, colored sticks, and assorted funky critters as ecosystems, we surely should be assured that we know the following: first, what an ecosystem is, and second, how our aquaria compare to this construct of nature. The thrust of this article will be that comparison, and subsequent articles will discuss some of the finer points of the management. Figure 1. The physical components of a coral reef are visible in this image. There are shallow hard substrate rocky areas (the dark blue submerged areas) in warm tropical water. 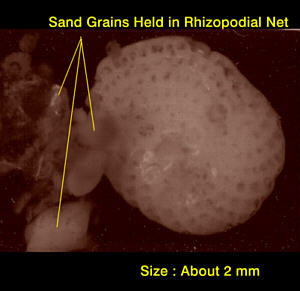 The white areas are unconsolidated or sandy sediments where the corals do not grow. Three components comprise all ecosystems. First, there is the physical environment. Second, there is the assemblage of living organisms, often called "the biota." Finally, and perhaps more difficult to understand, are the defined and stable pathways for the transfer of materials and energy through the system. In a very real sense, the Earth's biosphere may be thought of as a large and complex engine that uses energy (primarily solar energy, but there are a few other very minor energy sources) to turn raw materials into various microbes (mostly bacteria), as well as plants and animals. When any of these organisms die, their constituent materials return to some inorganic reservoir and eventually enter into the cycle again. The biosphere is comprised of an interconnected series of cycles of energy use and material transfer. Neither the Earth's surface nor the availability of solar energy is homogeneous, resulting in the myriad subdivisions of the biosphere, ranging in size from minute to truly enormous. These subdivisions each provide a basis for material and energy transfer in a particular physical environment, and are termed "ecosystems." As reef aquarists, the one that concerns us is the CORAL REEF ECOSYSTEM. The CORAL REEF ECOSYSTEM is discontinuous and delineated by a rather limited set of physical constraints. First, coral reefs are found in areas of hard substrata. Although unconsolidated or "soft sediments" may be found adjacent to reefs, the reef substrate itself is comprised primarily of hard rock and, as far as is known, all reefs initially got started on other bare rock substrates. Second, the coral/dinoflagellate symbiosis requires temperatures from about 68°F to about 92°F to function and this symbiosis is necessary for the development of modern coral reefs. Although a few reefs are outside those ranges, the vast majority are found within those limits. 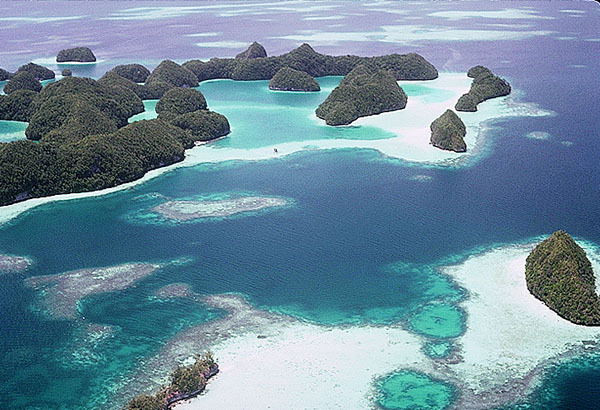 Such environments are basically found between the Tropics of Cancer and Capricorn, although a few places outside these latitudes support coral reefs. Third, the physical milieu surrounding coral reefs is relatively shallow water, generally water less than about 150 feet deep. This water typically has a salinity of 35ppt to 37ppt. A glance at a globe will quickly show that while the total area of the tropics is immense, that portion covered by shallow water is really very small, and of that small proportion, the subset with hard substrate is smaller yet. Nonetheless, if these areas have hard substrates, and appropriate water and temperature conditions they generally have coral reefs. Physical environments that fit all of these characteristics get a great deal of relatively intense and dependable solar radiation, and it is a characteristic of modern coral reef organisms that they have evolved some ways of utilizing this energy source. The biological assemblages of coral reef environments are really beyond our complete evaluation, for a couple of amazing reasons. First, these are amongst the most biologically diverse environments on the planet, and they are surprisingly unexplored and sampled. In contrast to biologically rich terrestrial environments such as tropical rain forests, the coral reefs are effectively terra incognita. Explorers and naturalists have been carefully and scientifically examining tropical rain forests for about 200 years. Coral reefs have been looked at in some detail, really only in the last 50 years or so. It has been said that science knows next to nothing about what is found in a tropical rain forest. If that is so, it is indeed daunting, as scientists know far less about the biology of coral reefs than they do about tropical rain forests. Third, as with surveys in any part of the marine realm, the length of time for surveys is physically severely constrained by the limitations of underwater field research using SCUBA or submersible vehicles. These factors mean that scientific or natural historic evaluations of coral reef ecosystems have been, and will continue to be for quite some time, superficial, at best, and ridiculous, at worst. Fortunately, for the purposes of the reef aquarist, we really dont need to enumerate the biota. So... I am off the hook, somewhat. Figure 2. Some zooxanthellae squeezed (with pleasure) out of an Aiptasia tentacle. The greenish spots are chloroplasts. These dinoflagellates, unlike most other members of the group, lack flagella once they take up residence in their host, and are immobile. These are only a few micrometers across. One other significant characteristic of this coral reef biota is that it, like the tropical rain forest, is dominated by organisms that can significantly increase the structural three-dimensional heterogeneity of the environment. However, in coral dominated areas the three-dimensionality of the environment is produced by the symbiotic organisms called corals, rather than by trees or other plants. The resultant structurally heterogeneous and topographically complex structures are called reefs. In a few other areas of the world, different kinds of biogenic reefs are formed, but they are neither as large nor as structurally complex as coral reefs. The ability of reef corals to increase the spatial heterogeneity of their area is a key to the diversity of life found on them, as this increase provides many more microhabitats for small organisms to live. The basis for life is the absorption of solar electromagnetic energy and its subsequent utilization as chemical energy. When life first evolved on the Earth about 3.8 billion years ago, this was likely an inefficient and wasteful process, but in the intervening years, it has been fine-tuned significantly. In a very real sense, any ecosystem is a body of organisms devoted to squeezing the last tasty drop of light-juice energy out of any given area on the Earths surface. The basis of life in most of the Earths ecosystems are organisms, such as bacteria, algae or plants, that use the energy they can collect from sunlight to bind carbon dioxide and water together to form a basic sugar along with the waste product of oxygen. This sugar formation is called photosynthesis, and it is truly the basis of life. On coral reefs, many of the organisms such as algae, true plants, and photosynthetic bacteria have photosynthetic capabilities. Others, including corals, tridacnid clams, some sponges, and even some snails, act as partial photosynthetic organisms through the action of their algal symbionts. All of their photosynthesis results in the same thing; it forms sugars. So why is this sugar production so important? The primary reason for that importance is that each sugar molecule took a lot of sunlight energy to make, and that solar energy can be recovered in an organism, by breaking down the sugar back down to its constituent carbon dioxide and water molecules. This process provides all living things with a source of useable energy. The energy used to make sugar by photosynthesis can be recovered from it by combining it with oxygen, or burning it. If you take some sugar and burn it completely, you will get light, heat, carbon dioxide, and water. However, in the water inside of cells, the sugar may be wetly burned in a controlled series of reactions, yielding energy that can be utilized by the cell, as well as carbon dioxide and water. In such reactions, the production of heat, or waste energy, is minimized. These reactions, occurring within cells, are basically the reverse of photosynthesis. and are called respiration, and the energy liberated during the process is used for all metabolic functions. Corals and other animals with zooxanthellae or other photosynthetic symbionts are really maximizing their energy gathering capabilities. Most algae (and bacteria) are "leaky," and a lot of the sugar they produce oozes out of the algal cells as a dilute syrup. 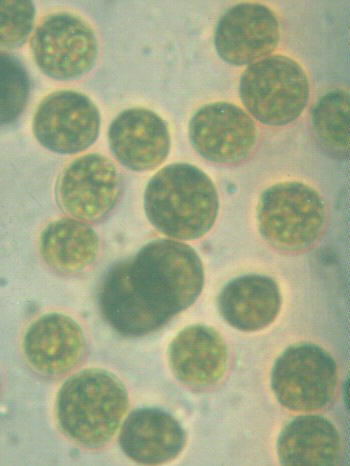 As the algae are living in and between the cells of their host, this sugar solution goes directly into the host cells and is utilized as food. In some cases, the host organism produces signals that trigger the release of more "syrup" than would ordinarily leak out. Respiratory energy is used by all organisms to power their cellular reactions; or put another way, it is absolutely necessary for life. Some other chemicals are necessary for growth since sugars cannot form the constituents of tissues. These other chemicals, primarily proteins and skeletal materials, must be obtained by other sources such as feeding or the absorption of materials through the surface of the organisms. Nevertheless, for these other materials to be used, the energy derived from sugar is necessary. Figure 3. Even though they have zooxanthellae, corals need to feed on some source of nitrogen to be able to build tissues. The sources might be, either animals, as apparent in these eating zooplankton, plants, or bacteria, or dissolved organic material rich in nitrogen. Obviously, in these situations, the corals are secondary consumers. All of this food enters an ecosystem and contains useable energy in the form of sugars, and structural materials in the form of proteins, minerals, and other materials. Energy and matter are moved through natural ecosystems by being passed from one ecosystem component to another. For example, plants form sugars which get passed to animals by the action of animals eating the plants. When those animals are eaten, the materials and energy get moved through the system even more. In most natural ecosystems, typically about three or four transfers occur before all the useable energy and matter are either fixed within a group of organisms, or lost to the system as gas or waste heat. Natural ecosystems have what are called trophic (or feeding) levels. The first trophic level produces the sugars or chemical energy. These organisms are referred to as "primary producers" and are photosynthetic organisms such as the zooxanthellae or algae. The next trophic level is made of those organisms called "the primary consumers;" these are the first organisms that eat the product of producers, either by eating the primary producer itself or its byproducts. Corals are primary consumers when they consume the byproducts of their zooxanthellae, or in those rare cases where they directly consume phytoplankton. The third trophic level is made of those animals that are "secondary consumers." These are carnivores, and are organisms that eat only animals or other non-photosynthetic organisms. Corals are secondary consumers when they eat planktonic animals. There may be several levels or links in various food chains comprised of secondary consumers; however the absolute number of these levels is limited by the efficiencies of feeding. 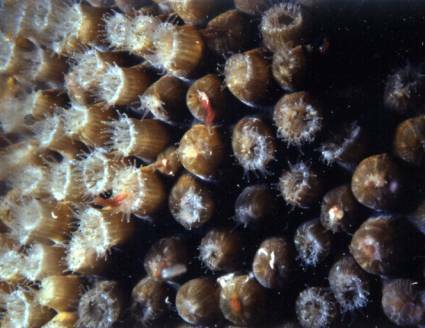 An examination of a hypothetical food web from an open ocean environment will show the limitation. Generally, each organism can assimilate about ten percent of the food that it eats. So, to produce one pound of tuna, a top carnivore, takes ten pounds of some small fish such as herring. Those ten pounds of herring are produced by 100 pounds of herring food such as large carnivorous zooplankton such as euphausids or krill. To produce 100 pounds of krill takes 1000 pounds of small zooplankton such as carnivorous calanoid copepods. Those 1000 pounds of copepods are the result of the consumption of 10,000 pounds of herbivorous microzooplankton such as ciliates or rotifers. Those 10,000 pounds of microzooplankton resulted from the consumption of 100,000 pounds of unicellular algae or cyanobacteria, the primary producers in the system. This food web would have six levels, and would imply that to produce 1 pound of tuna took about 50 tons of algal biomass. It is easy to see that there really could not be a specific oceanic predator living only on tuna. Each pound of that predator would need the production of about 1,000,000 pounds of algae, and that amount of production would cover so much ocean area that such a predator could not get enough food to stay alive and get big enough to eat a tuna. Most oceanic food webs have actually five or fewer levels. Figure 4. 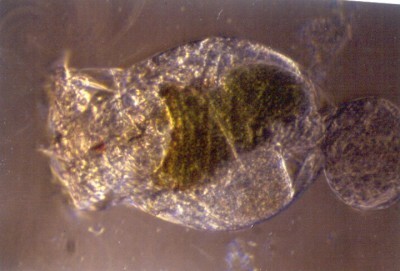 This rotifer is a primary consumer living in the plankton. The green area seen in the gut are algal cells undergoing digestion. If the organisms at each level only assimilate about ten percent of the food they eat, this means a lot of unassimilated food is pooped out of the animals of each level. This unassimilated, but still nutrient-rich, food goes to power the decomposers. These are the organisms, primarily bacteria and detritivores, that break down the wastes, debris, and detritus back to the basic building blocks so that other organisms can again utilize those materials. In doing this final breakdown, the decomposers also harvest the last useable energy out of the materials. For the ecosystem to remain functional, all of these levels must be present and functional. Otherwise material will accumulate at one level or another and either demand will outstrip supply for food or there will an be accumulation of partially utilized food resulting in pollution and fouling of the environment. I think that most aquarists can see that our aquaria are functionally organized similarly to natural ecosystems. In fact, the same trophic levels have to be found in our aquaria for them to remain healthy and, really, the only way our organisms may behave in a normal manner is if they are given a reasonable analog of the normal amount and kind of food. The organisms have no way of knowing they are not in a normal ecosystem, and so will react as naturally as they can to situations as they occur. Figure 5. The large white object is a foraminiferan, an amoeba-like protozoan that secretes a calcareous shell around itself. It is a member of the decomposer/detritrivore guild, and feeds on bacteria it gathers from between sand grains by the use of specialized pseudopods, called rhizopods. This organism was collected from one of my aquaria. To allow the organisms to live as naturally as possible in our marine reef aquaria means we must provide an analogue of the producer level. Although the producers in marine reef aquaria simply cannot produce enough biomass to feed the system, they have other important functions. These photosynthetic organisms use dissolved nutrients from the tank water and convert them into useable food, and in the process lower these levels toward the levels that are found in nature. Of course, nature finds a way, and if we dont provide the appropriate producers, there will be some in our tanks, such as microalgae and cyanobacteria, that will take advantage of the situation and thrive. Additionally, we must provide at least one, and more likely several, good and functional consumer levels, to eat excess food and thrive and, in the process, to pass that food to the decomposer level to recycle the nutrients, and to liberate all the stored ecological energy. With all of these levels in place, a coral reef aquarium is neither more nor less than a small captive analogue of an ecosystem. It meets all the necessary requirements of a small ecosystem, and there are numerous natural ecosystems just as small. Is it natural? It most decidedly is not! Can it be a functional ecosystem? Absolutely! When this functional ecosystem is well set up, it is an efficient and easy way to manage and keep our coral reef animals in the peak of health. The producer organisms in such an artificial ecosystem are the various algae, microbes (photosynthetic protests and bacteria), corals, and zooxanthellate organisms. The algal production converts soluble nutrients into exportable materials, such as macroalgal tissue which may be harvested periodically. The corals zooxanthellae produce sugars and facilitate coral growth. The consumer organisms are the fish, but also the corals, and other decorative animals such as feather duster worms, small bugs and scavenging snails. These animals consume animal foods for the energy and structural materials present within it. Left-over foods, dead microscopic or tiny animals, detritus, and animal feces are utilized by decomposers, primarily microscopic animals, protozoa, fungi, and bacteria. These organisms remove the last of the usable energy from foods and cycle the nutrients back to the consumers. Virtually all of the decomposers are found living in the sediments or within tiny spaces on the rocks. The most important of all of the trophic levels for the health of the system is the decomposer level, a guild of numerous kinds of organisms that work out of sight in the sediments. Without a functional decomposer assemblage or some other mode of export, nitrogenous wastes accumulate, nutrient levels skyrocket, and the system becomes polluted, will eventually crash, and likely kill or severely impact all other life in the system. So, for the best maintenance of the animals we like to watch (the corals, fishes, and other attractive organisms), we must work to maintain the health of many animals we cannot often see. Even if we could see them, they would probably be considered unattractive. Fortunately, being the ecosystem manager of a small marine reef aquarium artificial ecosystem is just a tad bit easier than being the manager of, say, Yellowstone National Park. It simply requires learning about and maintaining the animals under normal, natural conditions, and providing them with sufficient food to keep going. Increasing species diversity, particularly of the decomposer pathway, also facilitates stability by allowing the development of alternative ways for decomposition to occur. Export of excess materials is facilitated by the use of harvestable algae, and together with reasonable filtration by foam fractionation or other means will help keep the system stable and healthy with a minimum of maintenance. Scientists and researchers call these small ecosystem analogues "microcosms," and they have been used in marine research since the 1960s. They are a tried and tested type of system that promotes animal health. A lot of researchers use them for two major reasons: they keep the animals healthy, and they require a minimum of effort and maintenance. Of course, you don't get to spend a lot of money buying a lot of strange additives with miraculous claims, and generally odd pieces of expensive equipment are also considered excessive, but hey, you can't have everything. The concept of the aquarium as an artificial ecosystem is an easy and simple methodology for maintaining coral reef animals at the best of health, with a minimum of effort and expense by following the examples apparent and inherent in nature. This series will continue, with future articles concerned with discussing some of various examples of behavior, animal morphology, or system dynamics that allow us to maintain our small "slices of life." Over the next several months, I hope to go into more detail discussing the various aspects of setting up a functional aquarium ecosystem "in a box."